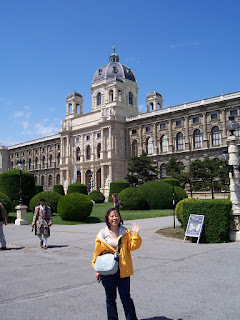 Kunsthistorisches, the Museum of Fine Arts in Vienna. 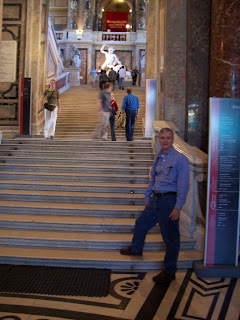 The Museum of Fine Arts houses paintings by Rubens, Rembrandt, Vermeer, Dürer, Raphael, Titian and Velazquez, as well as a comprehensive collection of Bruegel's paintings. 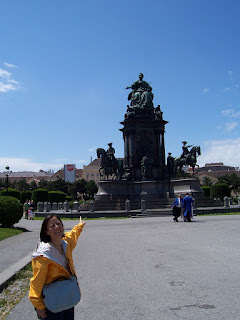 Statue of Empress Maria Theresa, the only woman to rule the Hapsburg Empire. 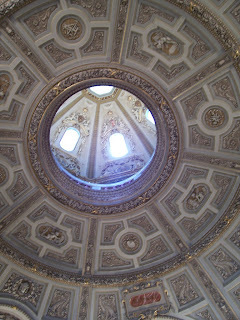 Ceiling of the Kunsthistorisches Museum. 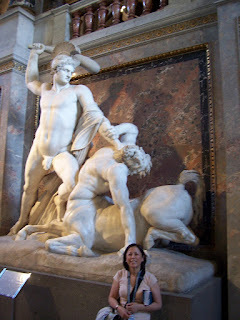 Antonio Canova's Statute of "Theseus Clubbing the Centaur"
A view of another part of the ceiling of the Kunsthistorisches Museum. 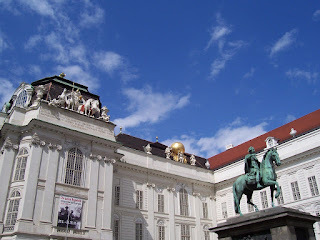 This "Secular and Religious Treasure Room" contains the jewels of the Hapsburg (Austria Empire). Slip through the vault doors and reflect on the glitter of 21 rooms filled with scepters, swords, crowns, orbs, weighty robes, double-headed eagles, gowns, gem-studded bangles, and a unicorn horn (or perhaps the tusk of a narwhal). 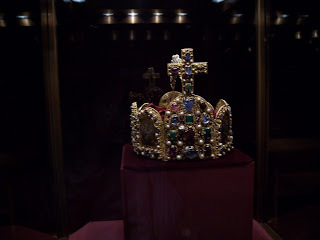 Imperial crown, part of the Hapsburg crown jewels in the ethnology museum in Vienna. 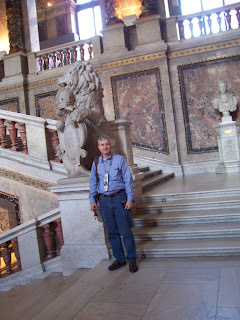 The crown's eight sides represent the celestial city of Jerusalem's eight gates. The precious stones on the front panel symbolize the 12 apostles. The 11th-century Imperial Cross preceded the emperor in ceremonies. Through the centuries, the Holy Roman Emperors actually carried this into battle. 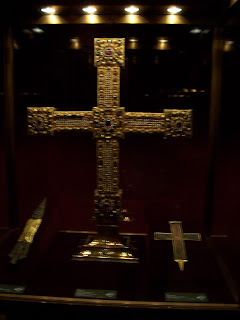 The holy lance on the left of this picture was supposedly used to pierce the side of Jesus while on the cross. 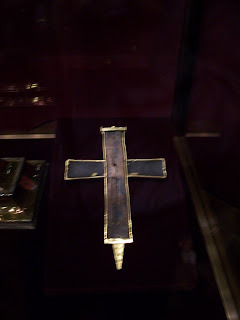 This was believed to be a substantial chunk of the cross. and includes a nail hole. 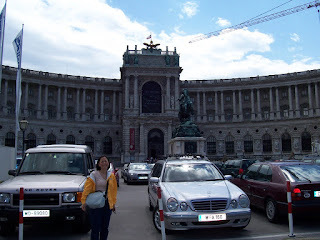 The Neue Burg (New Palace), its facade arches around the Heroes' Square. 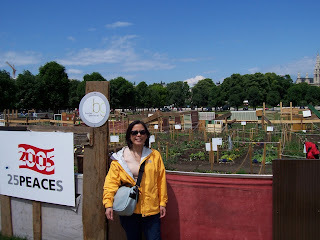 A public vegetable garden downtown Vienna. 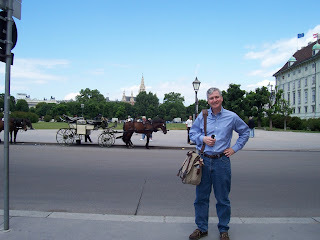 Now I realize I was a bit absent lately from your blog and was missing the Österreich-Bayern trip. 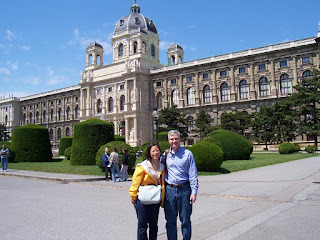 Great pictures and amazing tales from Vienna/Wien - Wein puts you drunk... ;)) - Salzburg, etc... 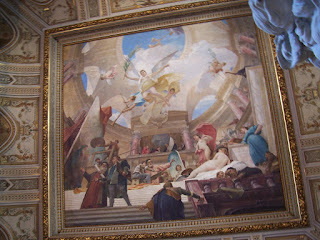 I've also had terribly busy weeks lately, and future is not promising, but I'll come back to see it more in detail.